Young Gifted and Black: Sad News: Remains found confirmed to be Avonte Oquendo's..Condolences to his Family!! 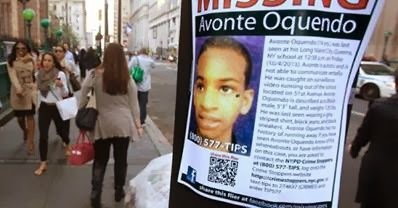 Sad News: Remains found confirmed to be Avonte Oquendo's..Condolences to his Family!! This is devastating news...So sad for the family, may they find peace in Prayer and receive strength as well. Human remains found last week along the East River belong to an autistic teen who walked out of his school more than three months ago and vanished, the medical examiner's office said Tuesday.